Immunogen :EZH2 antibody was raised against a 17 amino acid synthetic peptide near the amino terminus of human EZH2. Sample Data :Western blot analysis of EZH2 in 293 cell lysate with EZH2 antibody at 1 ug/mL. 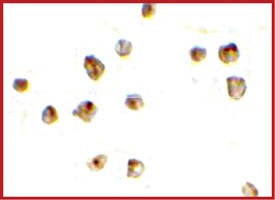 Sample Data :Immunocytochemistry of EZH2 in 293 cells with EZH2 antibody at 10 ug/mL. 3. Shen X et al: EZH1 mediates methylation on histone H3 lysine 27 and complements EZH2 in maintaining stem cell identity and executing pluripotency. Mol. Cell 2008; 32:491-502.